Congrats to our friends at Threadless!! Where do I personally even begin when it comes to Threadless? Before I started NoPattern as my full-time thing in 2004 I was packing t-shirts at their Chicago office and trying to learn as much as I could from a small group of dudes who I thought were doing some awesome things. Did I imagine they’d be as explosively successful as they are now in such a short amount of time? Not really, not this fast…but it certainly does not surprise me and I feel they completely deserve every bit of press, success, and praise they get. I’ll keep this short and to the point but I just really want to commend Threadless, specifically Jake Nickell and Jeffrey Kalmikoff, on what I think is their coolest piece of press to date. 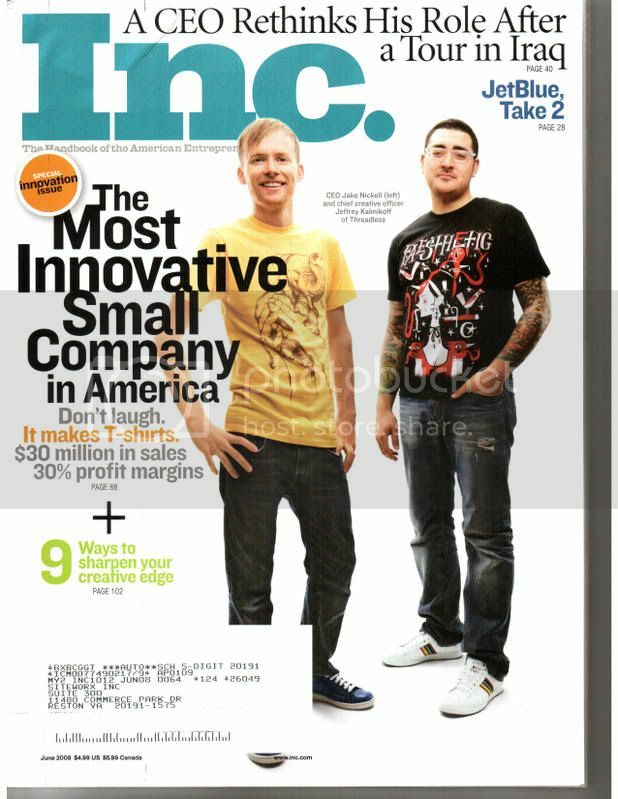 The cover of Inc. Magazine for June 2008. Super happy for these guys having watched them grow from a small office with shirts wedged onto a few shelves in a corner to a giant playground of an office with a warehouse staffed with people packing thousands of shirts a day. Nice headline on the cover too, sheesh! “The Most Innovative Small Company in America.” Again, congrats guys…Truly one of the most deserving and forward-thinking companies around. See the cover in the link below.